I described myself the other day to a writer I met, as the black sheep of my family. Since then I have given some thought to that term, and how it pertains to my current mid life crisis. We bandy about terms like that to label ourselves, put ourselves in our own comfortable pigeon holes. In reality our lives are our own creative journey, what is the point of trying to be someone you are not. It’s becoming one of my mantras – I will not apologize for who I am. Perhaps I only say that because in numerology I am a number 7, the intuitive loner. Number 7’s aren’t good at generally being subject to any one else’s agenda. So when I had my daughter Eva three years ago my life changed more than I could have ever anticipated or like to admit. She has reminded me of the value of my own time by essentially taking it all. She also inspired this blog. My daughter Eva reminds me of me, something that you need when you are almost forty and your own mother is trying to get you a job as her friend’s personal assistant. In fact if I am the Princess in my own fairytale then Eva is the pea, my responsibility, my fate, my niggling destiny. She is my reminder that when life throws you twenty mattresses, who you really are will keep you up all night, like Eva has on many occasions, in sickness and in health through tantrum and night terrors, never will we part. Eva always takes the second; she is a toddler after all. Her “courage always overrides her common sense,” another note from the universe, and as her mother I wouldn’t want it any other way. Eva makes me live up to my every word, and for her I am grateful almost as grateful as Eva the turtle is for dress up birthday parties. 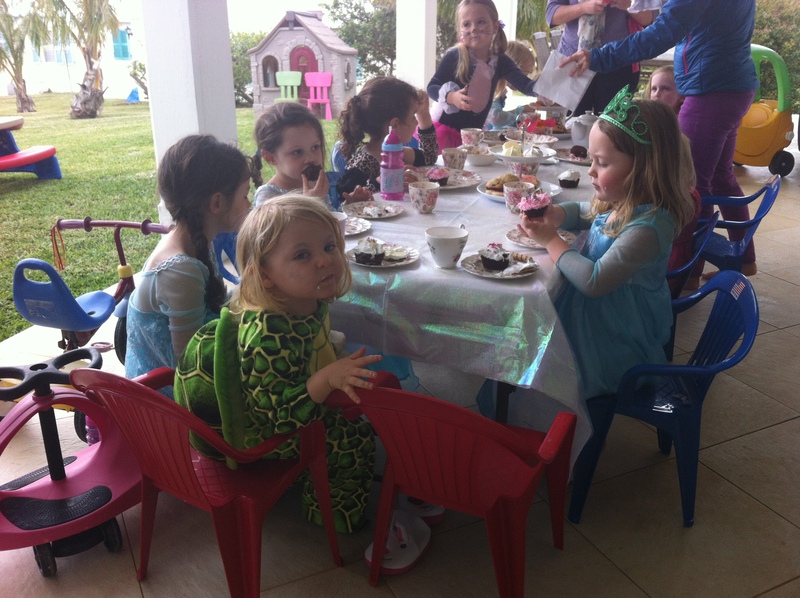 When we arrived late at Scarlett’s house, a Princess tea party had already begun. 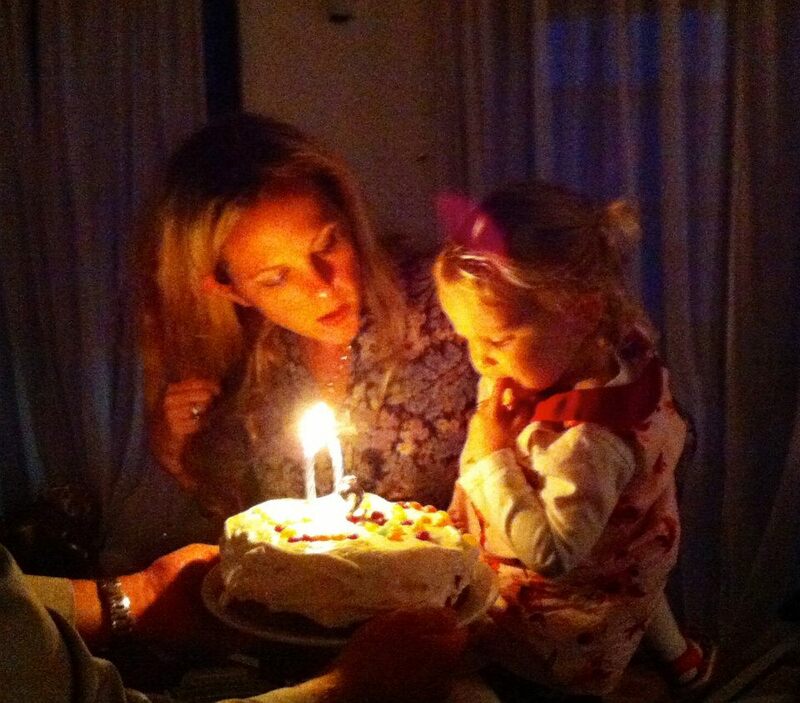 My little turtle wedged herself in between two among the twenty members of the royal family, in time for cake. 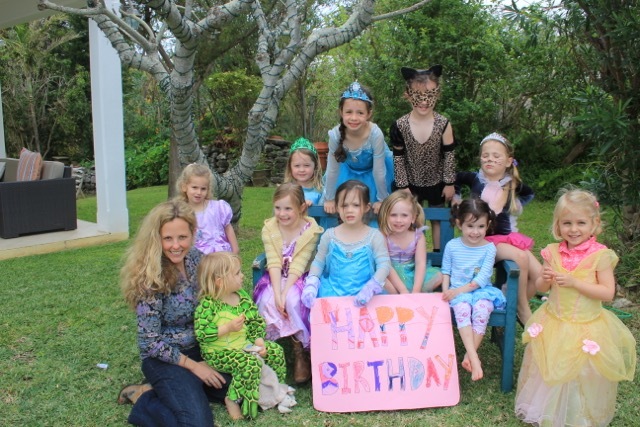 She stood out like a sore flipper: a turtle in a sea of princesses. 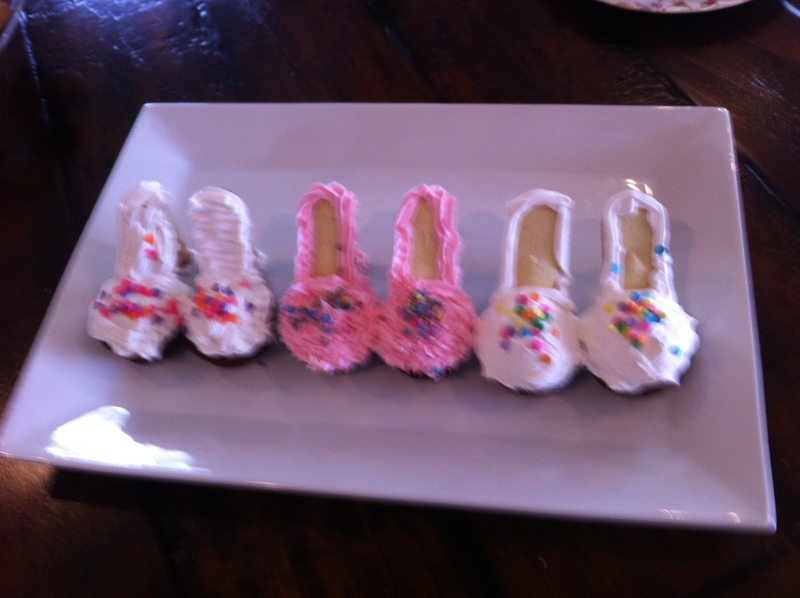 I was worried but there she was forging her own path to the glass slipper cakes. 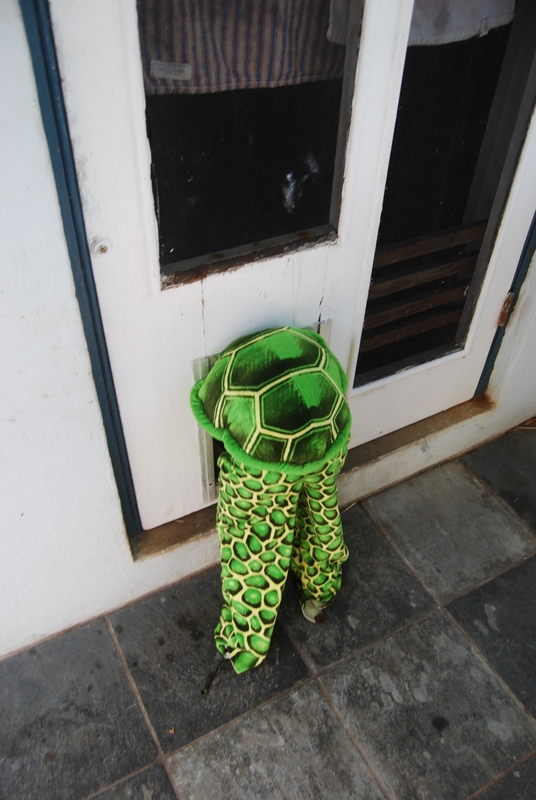 I spent the party following her around while she played by herself, occasionally interacting with a princess over entry to the trampoline or playhouse, but most of the time blissfully in her own little turtle world. It reminded me of a birthday party I went to as a child. My mother went to war with me about wearing a party dress, to my committed refusal. It became a battle of wills, which I eventually won. When I turned up at the party in trousers and a t-shirt I was the only one not in a dress. The birthday girl, half offended and half bewildered questioned me on why I had not worn a dress, to which I responded, “I didn’t want to,” to her committed dissatisfaction. I probably did not get a loot bag. Times have changed however and turtles are more accepted by the princess world, and I would not trade a turtle for a princess any day. There were at least five Elsa’s from Frozen at the party and I would rather have a turtle that simultaneously stands out from the crowd, and does not even notice. Here she is showing me her turtle flipper. Our collective mouths dropped and Avery’s mother went off to teach her daughter the ten commandments before she stabbed someone with her plastic tiara. Eva already knows everything she needs to about men at age three. I suppose I might be forced to reconcile that my little Eva won’t be a turtle forever, but as long as she keeps the same qualities of defiance, individuality and compassion she will be just fine and I will be her constant reminder. We will each be the pea to each other’s princess. Eva might even convince mommy to follow her through the dog door once in a while, just to be different.